This week, I had the opportunity to travel to a new place that I knew nothing about, which is one of my favorite things to do. I was honored to be hosted by Ohio Sea Grant for a stay at Gibraltar Island in western Lake Erie. For such a small island, it has a large amount of history, and it left quite an impression on me. The island is home to Stone Laboratory – the oldest freshwater biological field station in the United States. 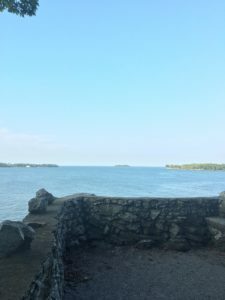 It also houses former island owner Jay Cooke’s castle and Perry’s Lookout, a lookout point frequently used by Commodore Oliver Hazard Perry, who won the Battle of Lake Erie over 200 years ago. One of the scientists there recommended this as a favorite spot, and I must admit, it was quite a lookout. The limestone cliffs on the side of the island are even older and more interesting. Their appearance resembles its namesake, the iconic Rock of Gibraltar, and though I could not find any elaborate maze of tunnels running underground, it was still beautiful to behold. In addition to the beauty of the place, I appreciate what it stands for. The island is owned by Ohio State University. Ohio Sea Grant uses Lake Erie as its classroom and playground, a place where scientists, faculty, staff, and guests can constantly learn and thrive. While there, I went out on Lake Erie to assist with data collection and visited the Aquatic Visitors’ Center on Put-In-Bay island, where I had the chance to hold a captive Lake Erie watersnake (previously endangered) and an Eastern Foxsnake. Ohio Sea Grant and Stone Lab are dedicated to science, education, and informed policy for the Great Lakes. At FLOW, these are the same principles that we live every day. Simply being in a physical location that exists for this sole purpose was very inspiring, and I look forward to returning. 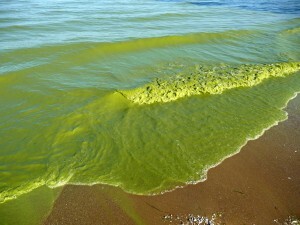 Last week, the U.S. EPA acknowledged the serious algae problem sickening western Lake Erie. It withdrew its approval of the State of Ohio’s decision not to declare the western Erie basin to be impaired. Does that mean the lake will be cleaned up soon? Hardly. EPA’s determination bounces the ball back to Ohio for reconsideration. If the Ohio EPA changes its mind, western Lake Erie will join the impaired list (where reality has already placed it), and a process to identify all relevant phosphorus sources and decide who must reduce by how much will begin. Years may pass before meaningful reductions are achieved. This is a shame for one of the world’s largest and most biologically productive lakes. Toxic algae cut off the public water supply of the Toledo area for a weekend in 2014, and large green blobs have plagued the western lake for a dozen years. It shouldn’t take years and years merely to launch a cleanup effort. There is a better way to get action – the public trust doctrine. In 2014, the International Joint Commission, which monitors the boundary waters shared by the U.S. and Canada, called for a 46 percent cut in the average annual phosphorus load in Lake Erie’s central and western basins to reduce the hypoxic dead zone, and a 39 percent cut in the average annual phosphorus contributed by the Maumee River to reduce harmful algal blooms. At the urging of FLOW, the Commission recommended achieving those reductions by applying Public Trust Doctrine legal principles to write and enforce restrictions unattainable using conventional regulation. The Public Trust Doctrine, based on ancient governing and legal principles, establishes the Great Lakes as a “commons,” community assets to be collectively protected and shared. The Commission called the doctrine a vital tool to update federal and state water pollution statutes, which essentially give cities, industries, and farmers the authority to pour specific amounts of contamination into the lakes. By acknowledging the Great Lakes as a commons, the doctrine could give governments fresh authority to protect waters from any source that would cause harm. Functionally, the public trust guarantees each person as a member of the public the right to fish, boat, swim, and recreate in Lake Erie, and to enjoy the protection of the water quality and quantity of these waters, free of impairment. 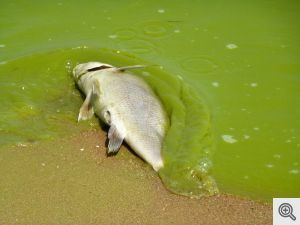 The effects of harmful algal blooms – from “dead zones” that suffocate aquatic species, to toxic secretions that close beaches and pose health hazards to boaters, fishers, and swimmers – are clear violations of the public trust. Thus, as sworn guardians of the Great Lakes waters under the public trust, the states have a duty to take reasonable measures to restore the water quality and ensure that the public can fully enjoy their protected water uses. There are two choices – a seemingly unending process of study and delay using conventional approaches, or strong action by the states, compelled by their citizens, to fulfil their obligations as trustees of Lake Erie. The fate of the lake hangs in the balance. A great article from the Blade, a Toledo newspaper, was just published which supports the need for a strong “waters of the US” rule under the Clean Water Act. This rule would insure that wetlands and tributary waters of the Great Lakes are not diminished, impaired, and the Great Lakes ecosystem and waters are not damaged. The article reminds us all that we share in the stewardship of the lakes, and that we should all strive to secure a safe and healthy future for our waters. Read more here. In the spring, the U.S. EPA and Army Corps of Engineers issued a rule to clarify Clean Water Act Protections to wetlands and streams. The rule, also known as the Waters of the United States rule, has not yet been finalized. Since the EPA introduced the rule last spring it has been under attack from many sources, including the Farm Bureau. The rule is needed to clarify the extent of the Clean Water Act, helping to protect small waterways and streams whose protection is currently uncertain. Thanks to the Healing Our Waters-Great Lakes Coalition (HOW Coalition) for sharing and supporting such an important issue! Click here to read the article on the Toledo Blade. One of the most pernicious sources of harm to Lake Erie, and to public use and enjoyment of the lake, is excessive runoff of phosphorous and other nutrients caused by farming practices and a lack of proper sewage treatment. This condition will only worsen without immediate action. Defining such action as a matter of public trust can help ensure that it occurs. Exacerbated by climate change, nutrient loading has caused devastating, harmful blooms of algae such as the dead zone that extended over western Lake Erie in 2011, covering an area the size of Rhode Island and Connecticut combined. These noxious blooms turn the surface and shores of the Great Lakes into a toxic soup — closing beaches and drinking-water plants, killing fish and fishing, marring private property, and discouraging tourism. Such effects strike at the heart of Lake Erie and the other Great Lakes, which contribute immeasurably to the quality of life of the 40 million residents of the lakes region. Nutrient loading also threatens public health and increases costs to taxpayers. Last year, the city of Toledo had to spend an additional $1 million to treat its drinking water for toxins in algae. 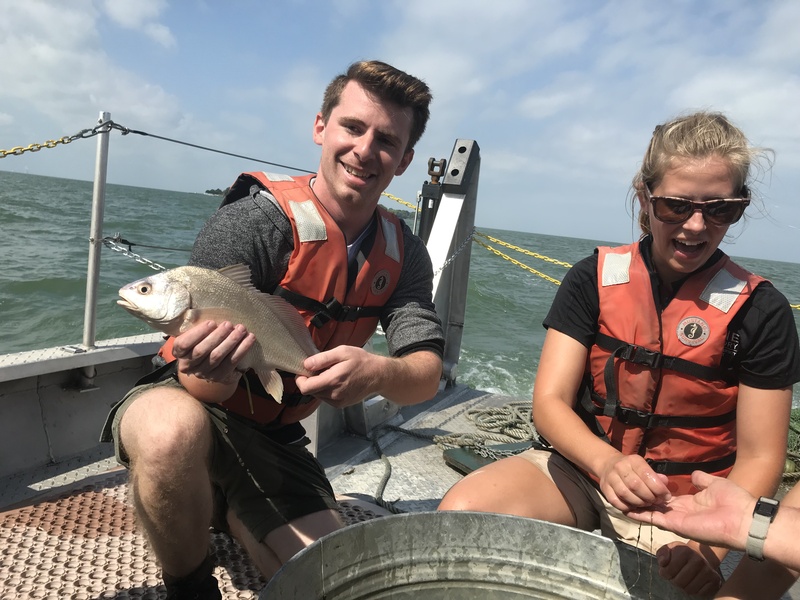 With a sense of urgency, the International Joint Commission — the American-Canadian governing board that is charged with protecting the Great Lakes — issued a recent report on Lake Erie’s ecosystem. It urges both federal governments and the Great Lakes states and provinces to take immediate steps to stop the lake’s toxic plague. The joint commission recommends an immediate cut of nearly 50 percent in phosphorus loading from excessive use of farm fertilizers and municipal sewage overflows, through modifications of current practices. 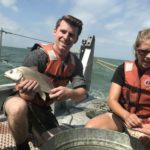 It calls for a fresh legal and policy framework for sharing responsibility and achieving the necessary reduction in phosphorus to restore Lake Erie and renew its beaches, fishing, and other natural advantages. Specifically, the commission proposes that the affected nations, states, and provinces hold Lake Erie as a “public trust” for their citizens. That framework “would provide the governments with an affirmative obligation to assure that the rights of the public with respect to navigation, fishing, swimming, and the water and ecosystem on which these uses depend are protected and not significantly impaired,” the report says. The principle of public trust, and the duties it imposes in navigable waters and tributary watersheds, are embedded in the law of the states and provinces on the Great Lakes. In 1892, the U.S. Supreme Court ruled that government has a duty to its citizens to ensure that their use and enjoyment of the lakes are never measurably impaired, now or in the future. This trust principle provides a benchmark, easy to understand and equally applicable to everyone. That’s a sharp contrast to the layers of rules that have been unable to stop the spread of devastating blooms of toxic algae. These blooms and toxic dead zones can be prevented. If we continue just to talk, but choose not to take the measures necessary to restore Lake Erie, more beaches will close, commercial fishing will dry up, and tourism, property values, and public use of the lake for recreation and enjoyment will continue to sink. 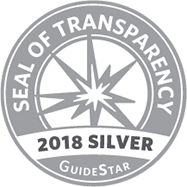 By contrast, if we choose to follow the joint commission’s public-trust recommendation, our government leaders, stakeholders, and citizens — who are the legal beneficiaries of this trust — will have a strong opportunity to save this magnificent shared resource. The commission should be commended for its bold leadership in urging public-trust principles for Lake Erie and the other Great Lakes. We should urge our government leaders to apply these principles, to reduce phosphorus pollution, and to restore Lake Erie. 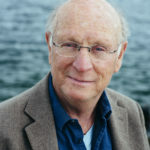 Jim Olson is founder and president of FLOW (For Love of Water), a policy organization based in northern Michigan that promotes preservation of the Great Lakes basin. Close to 60 participants tuned in; evident of concern across the Great Lakes Water Basin about the issue of reappearing harmful algal blooms (HABs) and “dead zones” in Lake Erie. Below is a quick summary of the discussion. Moderator Liz Kirkwood gave an overview of the issues: In the 1960’s, point source nutrient pollution was the root cause of HABs, under the regulations of the Clean Water Act and Great Lakes Water Quality Agreement, it appeared that the crisis was solved by the 1980’s. University of Michigan Professor Don Scavia gave an overview of the data that indicated the causes of modern HAB emergence: models require an average load input of dissolved reactive phosphorus to be reduced by 78%. Non-point source pollution is now the predominant issue of Lake Erie’s HABs. Circle of Blue correspondent Codi Yeager-Kozacek reported on the agriculture factors creating the new, emerging HAB problem: Today, farm technology and increased agricultural competition are factors to a different kind of nutrient pollution. Incentives to combat excessive nutrient runoff encourage updating Best Management Practices (BMPs), which today are not mandatory of farmers. The Great Lakes region generates about 15 billion dollars a year agriculturally. With high competition there is too much at stake to assume an unregulated industry will succeed. 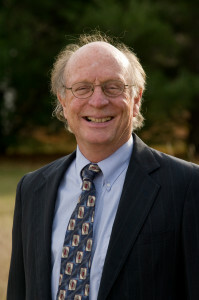 Dave Dempsey discussed how the The International Joint Commission (IJC), a binational organization, will resolve disputes about the use and quality of boundary waters between nations. 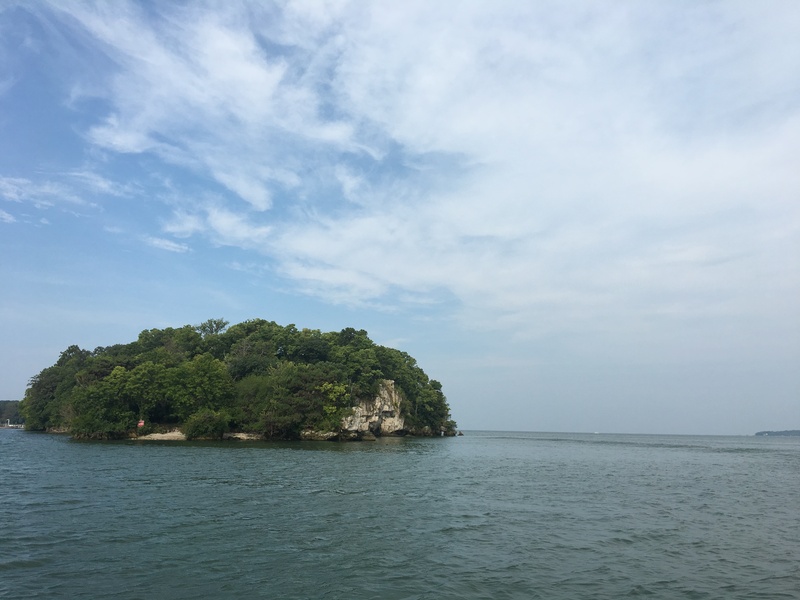 Their recent Lake Erie Ecosystem Priority (LEEP) report provided recommendations on nutrient pollution reduction and referenced FLOW’s Public Trust Framework as a strategy for future protection of Lake Erie. JIm Olson concluded the webinar with an explanation of FLOW’s Public Trust Principle. With a struggle against time, resolutions must be made that controls further degradation of Lake Erie. The Public Trust Principle is beneficial because it is both flexible and holds states accountable. It allows for future protection considering public opinion and scientific data, while addressing concerns raised by the other presenters. The webinar stimulated thought and closed out with an engaging Q and A, a few questions below. Q. Has the information on the need to ramp-up structural BMPs been shared with USDA/NRCS and EPA for consideration under the new GLRI Action Plan being developed now? A. Yes, information is being shared throughout the region addressing all the variables, not just BMPs. Information they feel is well know, however the time frame is not. Q. It appears the intensity of agriculture is WAY out spacing technological and political changes, what structures are in place for the political sphere to keep up with the industry? A. There are structures in place, such as the Clean Water Act, however we still need further reform collectively on what to do. There needs to be new standards for TMDLs and framework through court action that will hold parties responsible. Implementing Public Trust principles will help move this action forward as our current political sphere shows major gaps. Q. What current political structures are in place to effectuate political change to compel farmers to use strategies such as BMPs? A. The Farm Bill is the only solid structure as of right now. Nutrient trading may be something to explore in the future, yet it does not address TMDLs directly. There have been successes with it, but the EPA sets limits, and the state also sets their own creating conflict. We can consider modeling off chemical-trading as it has been done with air-trading programs. Wisconsin has a number of test programs in place right now that examine nutrient trading, the problem lies however in finding the right scale to measure based upon each watershed. Q. How does one get land tenants to change, we need non-farming landowners to implement these BMPs also but where is the incentive? A. Land use regulation should apply to all, in terms of buffers and structural practices. Watershed groups have the authority to regulate land practices that cause harm to waterways, be they agricultural or not. Landowners will be required to regulate in land use through laws sanctioned and passed by the state. Regardless of their specific practice it will be in the best interest of all to follow BMPs. 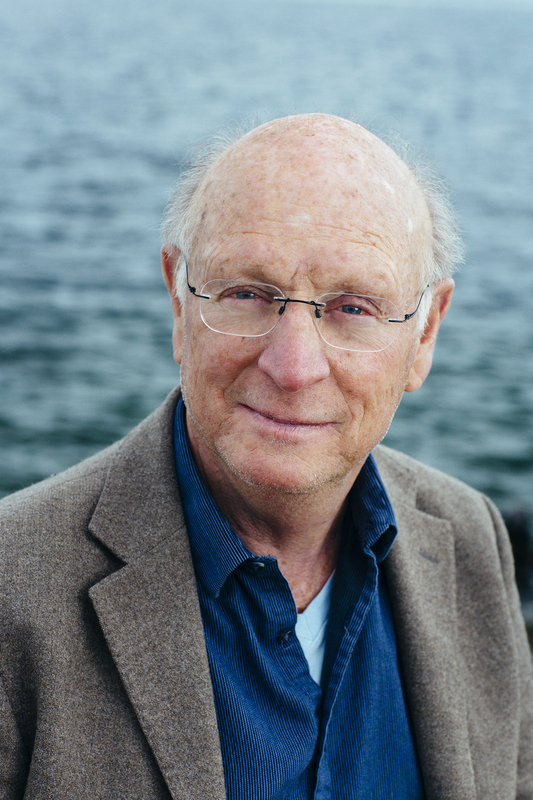 Editor’s note, Jim Olson is president of FLOW, a Traverse City-based non-profit legal policy and action organization whose mission is to advance public trust solutions to save the waters of the Great Lakes Basin. The health and public use and enjoyment of the Great Lakes is under siege from systemic threats like climate change, extreme water levels, Asian Carp and other invasive species, and nutrient pollution. One of the most pernicious dangers is the resurgent excessive phosphorous and other nutrient runoff from farming practices and lack of proper sewage treatment. Moreover, the situation is worsening because of climate change. 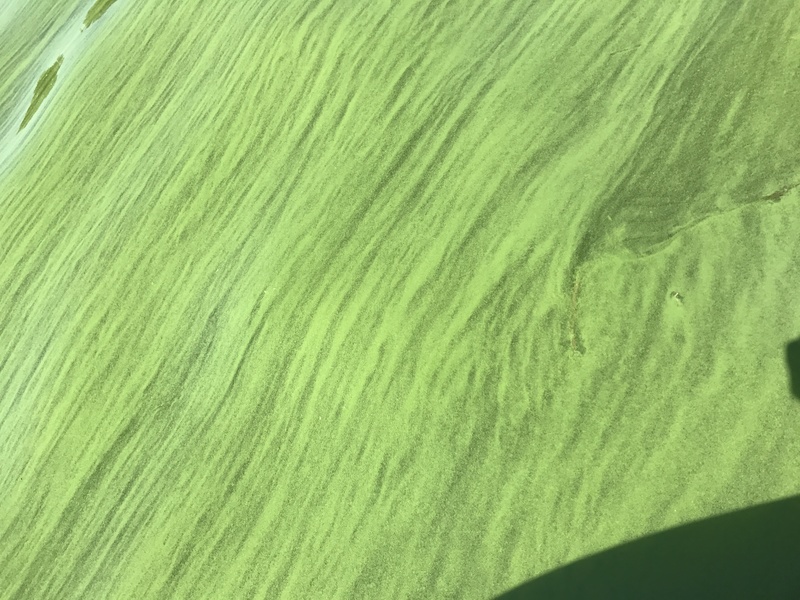 This nutrient loading has resulted in devastating, harmful algal blooms like the “dead zone” that extended over western Lake Erie in the summer of 2011, covering an area the size of Rhode Island and Connecticut. These algal blooms turn the surface and shores of the Great Lakes into a toxic soup, closing beaches and drinking water plants, killing fish and fishing, marring private property and public beaches, and discouraging tourism. These impacts strike at the heart of the Great Lakes and the uses enjoyed and valued by the 40 million residents who live in the Basin. In 2013, Toledo had to spend $1 million to treat its drinking water from toxic globs of algae. Unchecked, this chronic, worsening problem will strike a blow to the economy and quality of life in the Great Lakes region. Fortunately – with a sense of urgency – the International Joint Commission (“IJC”), the bi-national United States and Canadian governing board charged with protecting the Great Lakes, issued its Report of the Lake Erie Ecosystem Priority(February 2014) – A Balanced Diet for Lake Erie: Reducing Phosphorus Loadings and Harmful Algal Blooms.The report calls on Michigan, Ohio, New York, and Pennsylvania, and the province of Ontario to take immediate steps to stop this devastating toxic nuisance before conditions worsen, not only in Lake Erie but also in Lake Huron and on the shores of Lake Michigan as far north as the pristine Door Peninsula and Sleeping Bear Dunes National Lakeshore. Unfortunately, efforts to date have not reduced phosphorus or curtailed this massive problem, which is too large, too harmful, and too costly to the lakes, their ecosystem, and the 40 million people who live in the Great Lakes region to let this languish a year longer. While the challenge is daunting, the IJC has taken the helm and focused its scientific studies and strong policies on the responsibility of the states, province, and others whose practices are causing the harm to Lake Erie and parts of the other Great Lakes. The IJC has recommended at a minimum a cut in phosphorus loading from farming and sewage overflows and other runoff by nearly 50 percent. Possible actions include the setting of a total phosphorus limit in Lake Erie and adoption of best practices for the management and use of fertilizers on farms and lawns. Not only has the IJC set the target at nearly 50 percent and fingered the actions that need to be taken through voluntary cooperation, it has established a fresh legal and policy framework – or blueprint – for sharing responsibility, taking action, and, if necessary, implementing enforcement. The IJC has invoked a fundamental principle embedded in custom and law of the states and province on the Great Lakes – the duties imposed under “public trust” law in navigable waters and their tributary watersheds. In its report, the IJC recognized and urged states and Ontario to apply public trust principles as an overarching measure to address and solve the systemic threat of phosphorus and algal blooms in Lake Erie. 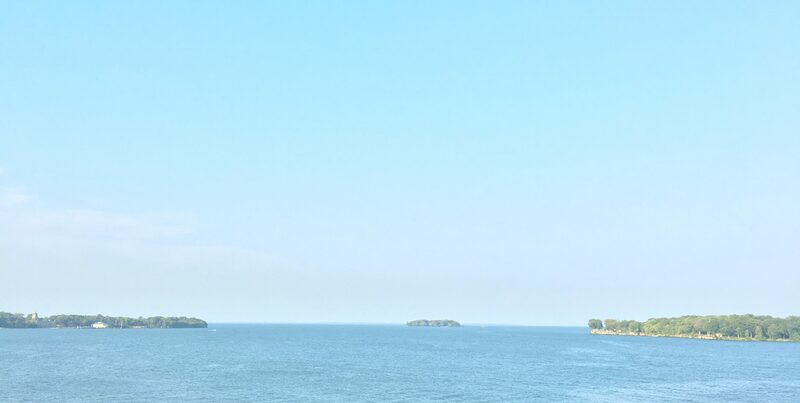 The governments of Canada, the United States, Ontario and the states that share a common boundary on Lake Erie could apply a public trust framework, a set of important common law principles shared by the states, provinces, and both countries. Under these principles the governments should hold Lake Erie as a public trust for their citizens. The public trust framework would provide the governments with an affirmative obligation to assure that the rights of the public with respect to navigation, fishing, swimming, and the water and ecosystem on which these uses depend are protected and not significantly impaired. In 1892, the United States Supreme Court established a principle that the Great Lakes and their protected public trust uses for boating, swimming, fishing, and other recreation can never be interfered with or significantly impaired now or in the future. A framework with a benchmark is necessary for the immediate reduction of phosphorus in Lake Erie and the other Great Lakes. The framework for cooperation and enforcement to achieve this benchmark is the public trust – a refreshing, straightforward contrast to the layers of rules and regulations that have been unable to stop the spread of devastating toxic algal blooms. Algal blooms and toxic algae “dead zones” can be prevented and Lake Erie restored by reducing phosphorous loading from farming, sewage overflows, and fugitive residential and commercial fertilizing. If we continue to engage in dialogue but chose not to implement measures or options that will reduce phosphorous and restore Lake Erie, more beaches will close, commercial fishing will dry up, and tourism, riparian property values, public use of the lakes for recreation and enjoyment will continue to sink. The public trust provides a fresh approach based on traditional, time-tested principles that will provide the framework from which the states, stakeholders, and all citizens, who are the legal beneficiaries of this trust, can work together with shared responsibility to save this magnificent shared commons. The IJC should be commended for this bold and positive step and for its leadership in urging the states and Ontario to implement the public trust principles that apply to all of the states and Ontario and their citizens. These principles move this bi-national issue to a higher level centered on our core values – water protection and restoration, quality of life, and a sustainable economy – that honor the public trust that, in the long run, will protect the waters and uses on which we, our children, and grandchildren depend. As a citizen beneficiary of the public trust in our Great Lakes, read the report, send the IJC a letter or email thanking the commissioners for taking the action they did in issuing it. Send an email, a letter, and make a phone call to the leader of your state or province, urging application of this public trust framework and these principles. If we follow the benchmark through public trust principles, we will establish a framework for these common waters and interdependent economy and quality of life for this and future centuries. All hands on deck – for implementing the public trust for water! Reach Jim Olson at FLOW, 153 ½ E. Front Street, Traverse City, MI 49684. Phone: 231.944.1568. Additional background on the author and FLOW. On May 13 FLOW is hosting a webinar on nutrient pollution and algal blooms. Space is limited; registration required. TRAVERSE CITY, MI – Registration is limited for the May 13 12pm ET webinar on Nutrient Pollution, Harmful Algal Blooms, and Dead Zones in the Great Lakes. Join Dr. Don Scavia (University of Michigan), Dave Dempsey (International Joint Commission), Codi Yeager-Kozacek (Circle of Blue Correspondent), and Jim Olson (Founder, FLOW) for an interactive webinar discussion on nutrient pollution and resulting harmful algal blooms (HABs) in the Great Lakes, and how the public and the states together can utilize the public trust doctrine framework as an added decision-making tool to address HABs in Lake Erie and beyond. This is the third webinar of Council of Canadians’ Protect the Great Lakes Forever Virtual Townhalls. Learn more about Council of Canadians’ Protect the Great Lakes Town Halls. FLOW is the Great Lakes Basin’s only public trust policy and education 501(c)(3) nonprofit organization. Our mission is to advance public trust solutions to save the Great Lakes.